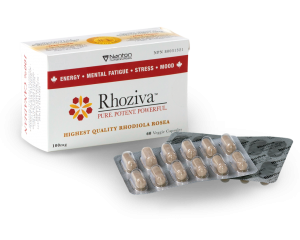 To participate in our Rhoziva 6 Day Challenge and receive your free sample, simply fill out your contact information. We would love to hear how Rhoziva worked for you, so make sure to stay in touch and we will be happy to send you promotions/coupons on future purchases. Please share your testimonial online through our website or connect through social media and share! Rhodiola rosea is the world’s most powerful adaptogenic herb with the most unique and extraordinary benefits. While contributing to energy production, Rhodiola rosea is included among a small number of botanicals called adaptogens. Adaptogens differ from chemical stimulants (such as nicotine and caffeine) in that they are physiologically and psychologically beneficial as opposed to being harmful and addictive. Rhodiola rosea improves physical and mental performance, reduces fatigue and increases alertness and attentiveness. One of Rhodiola rosea’s most notable properties is that of balancing the human body’s stress response. It is well recognized that a physically negative reaction to stress is the main contributing factor to sickness and disease. By helping you deal with stress, Rhodiola rosea is a simple and proactive first step in bringing your mind and body into balance.